Incoterms are the official International Chamber of Commerce (ICC) rules for explanation of trade terms. Incoterms are adhered to by all major trading nations of the world, and they are the authoritative text for determining how costs and risks are allocated to the parties conducting international transactions. Incoterms facilitate the conduct of international business by defining the responsibilities of the involved participants. In this series, we’ll explore all 11 Incoterms by investigating the basic meaning of each trade term. The first Incoterm I’ll discuss is Free Carrier (FCA). What Does the FCA Trade Term Mean? When Can FCA Be Used? FCA can be used for any mode of transport—air, courier, truck, rail, vessel or multi-modal shipments. A seller agrees to FCA Incoterms 2010 ex seller's premises (you can substitute this for an actual collection point with full postal address details). On this basis, the seller's cost responsibility is limited to the mandatory provision of export clearance, with no additional costs being incurred. The responsibility of collecting the goods from the exporter's premises and having them forwarded to the final destination is the responsibility of the buyer. The risk in transit transfer point also happens to be at the seller's premises. Flexibility of use. Carriage can be decided by the buyer or the seller on the behalf of the buyer. 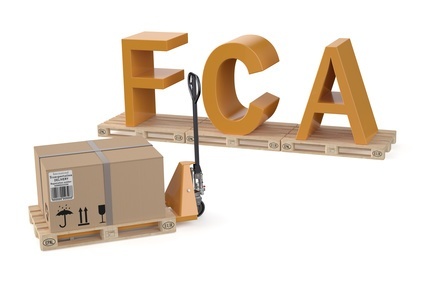 Because the term FCA is flexible, it can lead to misunderstandings between the seller and the buyer as to which costs accrue to which party and who is responsible for providing transport documents. This is because the delivery point under FCA can vary anywhere from the seller's premises to the point of export, be it the wharf or the airport, or where land-based transport is used for export, the road or rail terminal. You can learn more about that issue in Roberto Bergami’s article, Variations in Using Incoterms 2010. Being as precise as possible with the delivery address will help you avoid potentially costly mistakes with FCA. There are myriad resources available to help you further understand the trade term FCA and all Incoterms. We have a robust archive of Incoterms-related articles on our International Trade Blog. To get you started, we’ve chosen several of our most popular helpful articles along with other industry resources. Shipping Solutions export documentation and compliance software can help you streamline the process of adding Incoterms and making sure your documentation is correct throughout the transaction. You can try it for free today!